The world is a better place when Tiger is golfing well. The hatred from the tolerant left will rain down on Tiger. The pressure will be on Whoopie because the white women on The View won't be able to rip Tiger. Tiger stands for Our National Anthem! If Tobert DeNiro can get it, so can Tiger. Was thinking the same. What happens if he bows out and doesn't accept? Could backfire on Daddy. 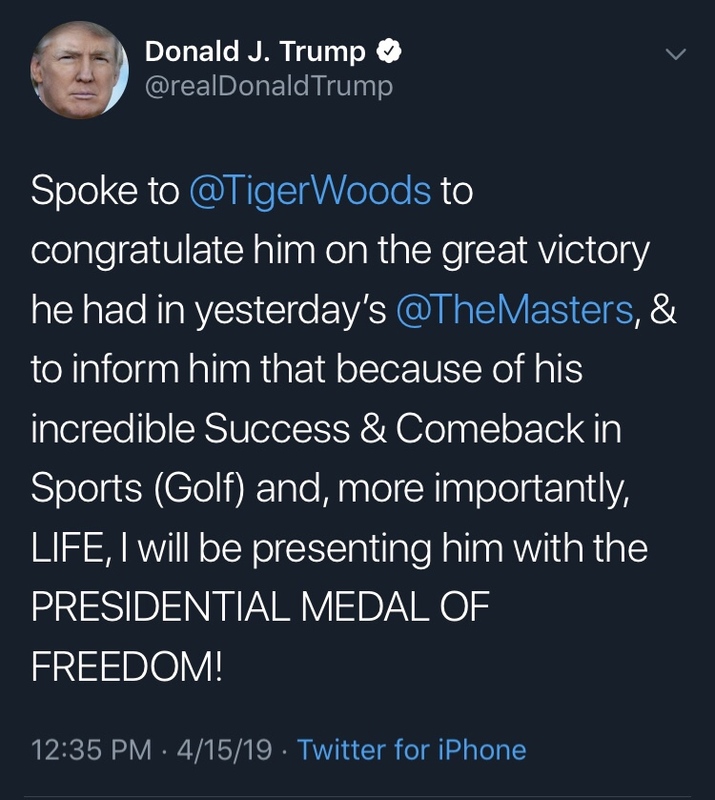 He’s only giving the medal of freedom to Tiger’s white half. What happens if he bows out and doesn't accept? I would hope that at this point, his staff have already reached out to Tiger and he's assured them he would accept. If the left attacks Tiger with "what did he do? He won a golf game" then they will get a feel of how many of us felt about Obozo winning the Nobel Prize. At least Tiger accomplished something first and got the award second. But, but muh racist Trump. @ the unhinged left. tiger did a lot for golf. maybe trump should imitate tiger’s commitment to really being great. Can't tell if your post was a joke or not.. But, Tiger doesn't have a white half, buddy.